Do you want to pray for our government leaders but don’t know where to start? 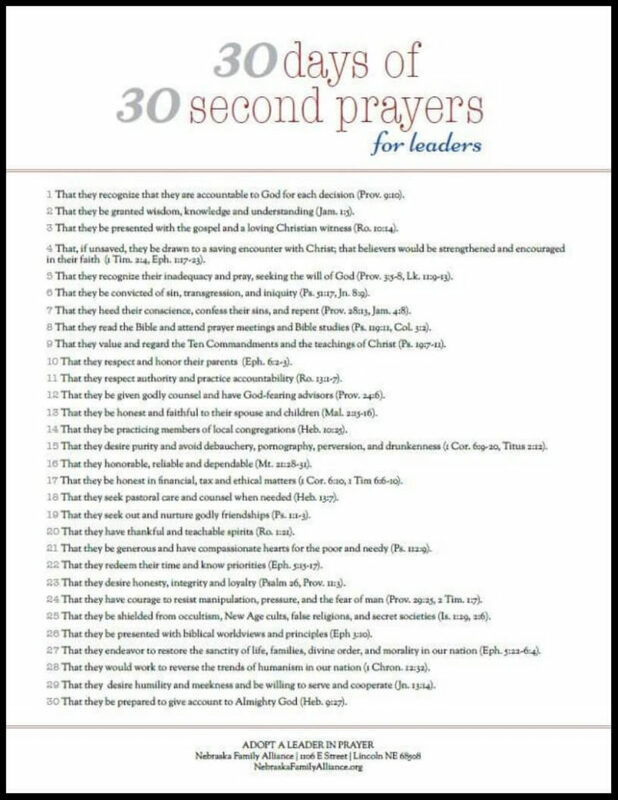 Adopt a Leader in Prayer! Let us not forget our elected leaders are also parents, spouses, friends, and neighbors. They face the same pressures we do every day, yet their public role means their decisions impact hundreds. 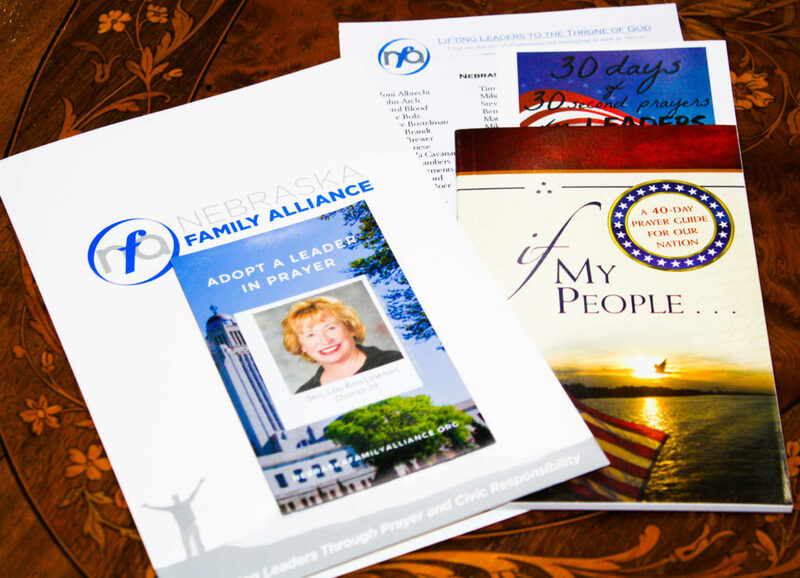 For a full list of elected officials that represent Nebraskans, along with 30 ideas for daily prayers for these leaders, click here. 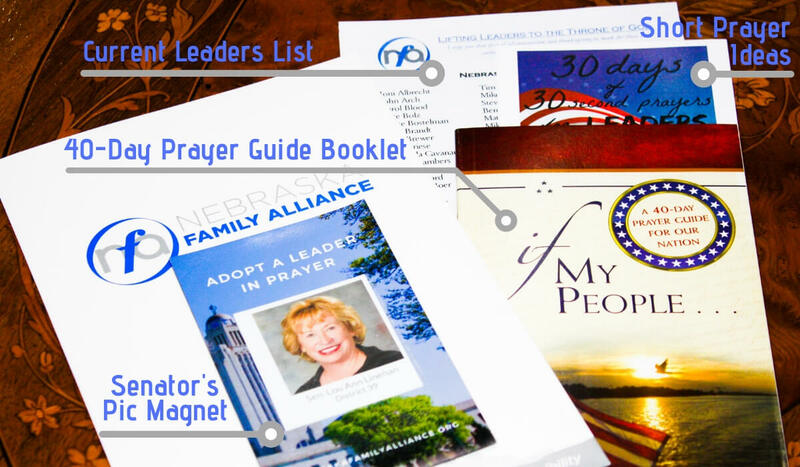 If you join Adopt a Leader in Prayer, NFA will send you a free prayer resource packet. It also includes a magnet with a photo of your State Senator, to help remind you to pray daily for your elected leaders. What is in a packet? Click here. Would you like to receive the NFA Newsletter? Stay in the loop by receiving our hard copy newsletter list. We send a quarterly newsletter as well as occasional event invitation postcards. Would you like to join the NFA Email Network? Our goal is to respect your time and your inbox. We send a bi-monthly Monday Minute prayer and policy report as well as timely Action Alerts for you to make a difference. Would you like to join Capitol Link NFA's text network? Receive NFA's most urgent prayer requests straight to your phone when: critical votes are being taken at the State Capitol; our team members are testifying before committee hearings; or we need people to take action and contact their elected representatives. TEXT “PRAYNFA” TO 402-979-7729 TO JOIN! OR - Enter your cell phone number above and we'll add you to the network!